Light a grill. We used gas, for ease and speed. For cooking vegetables it’s a good method, as it leaves you clean grilled taste A charcoal grill may end up overpowering the dish with a smoky flavor. Slice the zucchini into 1/2 inch discs. Get a good sized piece of tinfoil. Spray it with a non-stick spray. Add the zucchini, tomatoes, garlic, oil, salt and pepper. Toss all the ingredients together, I use my clean hands, or use tongs. Try not to rip the tinfoil in the process! Bring the left and right edges of the tinfoil together and fold them together, two or three times, to seal . Now fold the top and bottom edges together to created a nicely sealed packet. The sealed packet will make the veggies all steam together nicely. Turn the grill down to medium. Put the packet on the grill, cover, and cook for 10 minutes. With a spatula or tongs, turn the packet over and cook an additional 10 minutes. 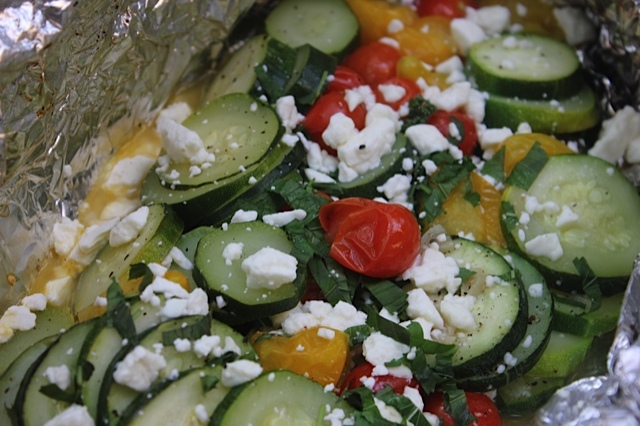 After those ten minutes, open the packet and top with feta and mint. Close the packet back up and let cook an addition 2-3 minutes, until the cheese is a bit melty and the mint is fragrant. My garden is slow going this year, I chalk it up to the cool nights we’ve had. (Couldn’t possibly be to any lack of attention on my part!) But, I have plenty of cherry and yellow pear tomatoes, cucumbers and recently, zucchini. Which brings me to my first recipe. I made this for the first time when our kitchen was in the middle of being renovated. I was cooking everything on the grill, and only using paper plates! I cooked all the veggies in tinfoil packets, so I wouldn’t have to wash the pans in the laundry room sink. So this recipe came into being, and we really enjoy it’s simplicity and sharp variety of flavors. 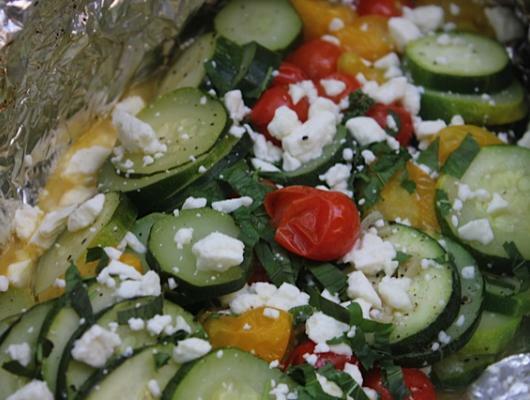 The colorful fresh vegetables, the tang of the feta and the brightness of the mint create a great side dish, that can end up outshining anything else on the plate.